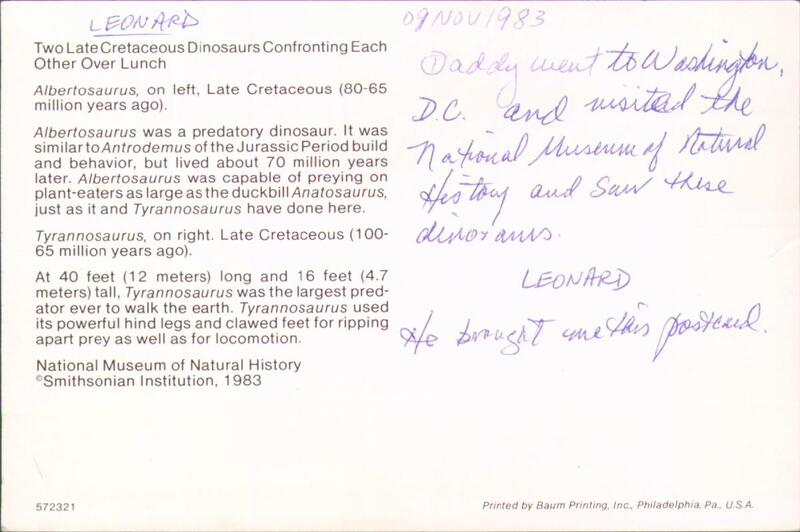 Daddy went to Washington, D.C. and visited the National Museum of Natural History and saw these dinosaurs. He brought me this postcard. Albertosaurus, on left, Late Cretaceous (80-65 million years ago). Albertosaurus was a predatory dinosaur. It was similar to Antrodemus of the Jurassic Period build and behavior, but lived about 70 million years later. Albertosaurus was capable of preying on plant-eaters as large as the duckbill Anatosaurus, just as it and Tyrannosaurus have done here. 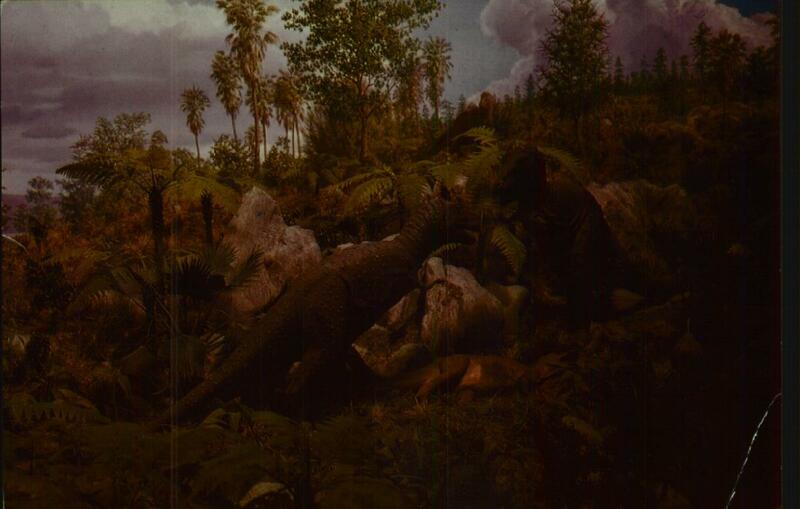 Tyrannosaurus, on right, Late Cretaceous (100-65 million years ago). At 40 feet (12 meters) long and 16 feet (4.7 meters) tall, Tyrannosaurus was the largest predator ever to walk the earth. Tyrannosaurus used its powerful hind legs and clawed feet for ripping apart prey as well as for locomotion. This postcard showed up before and I didn't transcribe the whole thing. This time I did and I gotta say I'm not impressed. I don't think it helps anyone to explain Albertosaurus by saying "oh, it was similar to Andtrodemus."